This solution has 30 positive votes and 10 negative votes. Please log in to vote. 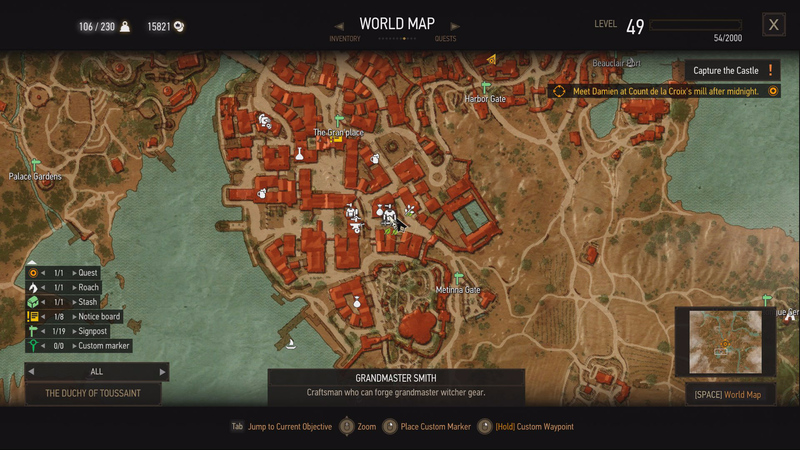 New to Blood and Wine is the mechanic of "Witcher Gear Elements." These bonuses are passive buffs obtained in one of two ways. To gain a lesser bonus element, you must equip at least three pieces of a single Witcher gear set. However, if all six pieces of one gear set are equipped, you will receive a second, more powerful bonus element. These element bonuses can only be obtained with the Grandmaster variants of each School - Feline, Griffin, Manticore, Ursine, and Wolf. On top of this, you must be a Level 40 in order to equip Grandmaster gear. In order to craft this gear, you must visit the Grandmaster Smith in Beauclair. His shop, Lazare Lafargue’s Workshop, can be found in the southern district of the city, just south of The Gran Palace fast travel signpost, and slightly north of the Metinna Gate fast travel signpost. He is the only smith in the game who can craft Grandmaster equipment. Take a look below for each School's lesser and greater bonuses, and once you equip a full Grandmaster set, this achievement will unlock. - Three: Strong Attacks increase Fast Attacks for 5 seconds by 10% for each piece of the set. - Six: Rear attacks deal 50% more damage, and also stun opponents at the cost of 1 Adrenaline Point(s). - Six: The size of Yrden traps is increased by 40%. While you are within a Yrden trap, Stamina regeneration is increase by 5/s and Sign Intensity by 100%, and damage is reduced by 20%. - Three: Critical hit chance and critical hit damage also apply to bombs. - Six: The maximum number of charges for each alchemy item is increased by 1. - Three: When a Quen shield shatters, there is a chance a new one will be cast at no Stamina cost. The bonus increased by 5% for each piece of the set. - Six: Damage dealt by Abilities involving the Quen Sign is increased by 200%. - Three: Up to three different oils can be applied to a sword at a time. - Six: Bombs are thrown without any delay. Once all six pieces to one Grandmaster Witcher gear set are equipped, the achievement will unlock. In the event that you require the funds necessary to craft at least one of these Grandmaster sets, you can farm enemy bandits in any of the hansa bases of Toussaint. To do this, you'll want to kill everyone minus the hansa leader, loot their weapons, leave the region, then return. All of the enemies will have respawned and you can continue killing them to farm their weapons, which sell for 250-300 coin when sold to the Grandmaster Smith.